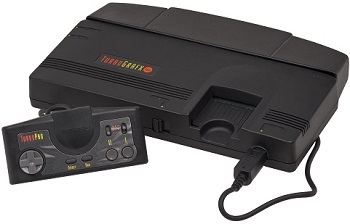 All versions of the TG-16 / PC Engine can output RGB, some with an adapter and others with an internal modification. The Turbo Duo and PC Engine Duo consoles don’t have a rear expansion port, so the only way to get an RGB output is with a modification. You can do this mod yourself, or have a modding service do it for you. Alternatively, you can buy a pre-modded Duo, but MAKE SURE it’s a reputable seller!!! I’ve received many emails from people who purchased pre-modded Duo’s that work poorly, or not at all!!! Voultar’s THS7374-based board This is a great TG-16 / PCE amp that sends RGBs through the high-quality THS7374 amplifier that’s had the filter turned off for the sharpest possible output. It also has a built-in sync stripper and options for TTL and 75ohm csync. AV Driver: Tim Worthington (creator of the NES, N64 and 2600 RGB mods) designed this amp with the PC Engine in mind. It can be installed in any version of the console and amplifies both video and audio. It’s my opinion that if you have a TG-16 or PCE and aren’t using the expansion port, just get db Electronics solution; There’s no modding involved and it’s a really high quality output. If there’s a chance you’ll use the expansion port, or if you have a Duo, I recommend a THS7374 board. If you decide to do any internal mod, I strongly recommend that you do a cap replacement and jailbar fix on your console as well, since you’ll already have it open. PC Engine SuperGrafx 1941 COUNTER ATTACK US SELLER! New!